Co-op is a supermarket unlike any other. With an emphasis on ethical trading and great value, it’s easy to understand why we love it so much. With their great range of vegetarian and vegan food and focus on Fairtrade products, it’s easy to see why Co-op is THE place for the conscientious consumer. We all know what it’s like. You’ve put the kids to bed and suddenly realise that you’re missing that essential ingredient. Maybe the Co-op is a bit too far to go out to for just one thing. Or maybe you’ve had a long day and just need a glass of Fairtrade wine. Here at Pinga we can take the strain and get you what you want in a blink of an eye. The process is really easy with Pinga. First download our handy app, then tell us your request, and one of our Pinga Partners will get back to you straight away. The details of what you are after will then be clarified, you can pay through the app and then off they’ll pop to bring your request straight to you.. You don’t need to spend a minimum amount with Pinga so you can just order exactly what you want, when you want, and have it bought straight to you. Our Pinga Partners are trusted, reliable and ready and raring to go. They will get you your Co-op request quickly and with care. If you want something picked up from somewhere else, that’s absolutely fine too! Actually, we love that. Just put your request through and our Pinga Partners will pick it up and bring it to you. We’re here to help at Pinga and would love to have you here with us. To get started today, here’s a closer look at our service and how everything works. Pinga delivers any items from Co-op today. 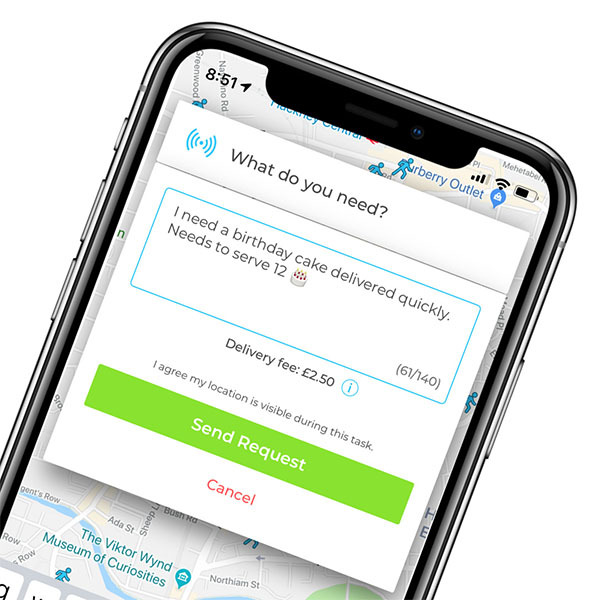 Infact our service normally delivers within an hour, so if you’re looking for same day delivers from Co-op, send your request via the Pinga App. Describe what items you needs to be delivered from Co-op and send your request. Pay securely within the app and receive your Co-op items to your door!